Shaz by the Sea: Best Father's Day Present Ever! Happy Father's Day to all the amazing Dads out there - especially Frankie, Tom, and Jimbo! We had such a great weekend! Thanks to my Mom and Dad for having the boys over for their first sleepover! Below, I posted a few pics bringing it back to our days with two newborns in Washington, DC. Feels like forever ago and yesterday all in the same. Also - Happy 36th Anniversary to Barbie and Frank! To celebrate my Dad and my kiddos Dad, I had a little cookout yesterday and thankfully both Jim and my Dad were able to be there. Chrissy and Linds were also in town so they were able to come by. We had a great day! Gorgeous weather too!! Jimbo opened a few presents - and Caden helped. BBQ, bounce house, presents, and strawberry shortcake...yum! Prior to the cookout, we went to Lowes and Calareso's in Reading. We bought three different kinds of sausages, corn on the cob, strawberries, watermelon, apples, bread, rolls and tomato plants! We are email club members so we get some amazing prices. Love it there!! We set up the slip n slide on Saturday and the boys didn't love it haha. They walked through it very carefully - there was no slipping or sliding at all. For Father's Day this year, my mom and dad took all 3 boys for their first sleepover at Grammy and Papa's house! (Cal has slept over but not Conor and Caden - and DEFINITELY not all 3). This was an exciting adventure for the boys. Plus, earlier in the week, Conor was asking to sleep at Papa's, so timing was pretty perfect. My parents said they were really well behaved, so that made me happy. Jimbo and I ventured in to the North End - first stop, BRICCO! They have the absolute best espresso martinis, so we figured that would be a great way to start the night. Then we grabbed a loaf of olive bread and headed over to the Hyatt where we got married via the water taxi. We checked into the hotel, grabbed a few drinks and sat outside overlooking the skyline. This is literally one of our most favorite things to do. A big thank you to the Hyatt for the room upgrade. It is the best view ever! Later that night, we took the water taxi AGAIN and ventured over to the Seaport for dinner at Legals on the water. Jimbo drove the boat right into the Legals area - he loved it! A HUGE thank you to my Mom and Dad for taking the boys for the night. My Dad had to work Sunday early, so my Dad said my mom did a great job with them solo. Thanks guys!! And happy anniversary today! We took the boys to Woburn's annual "Flag Day" at Library Field. We live close by so we took the wagon/stroller and walked. 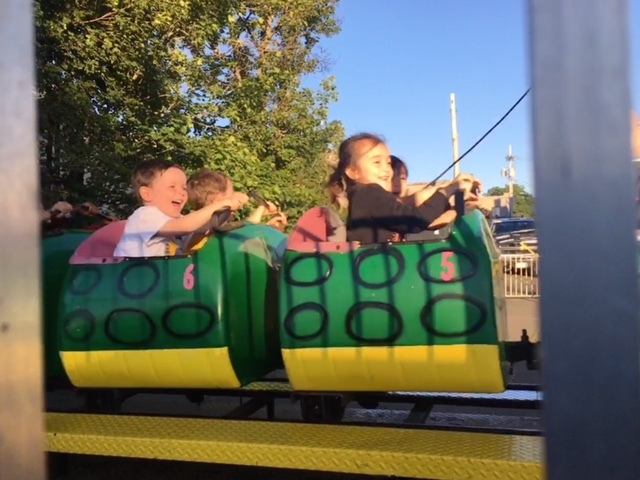 Conor and Caden's favorite ride was this dragon roller coaster. 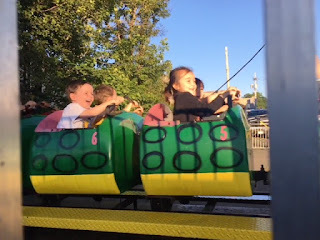 Conor absolutely loved it and was so care free - Caden loved it, but was trying to figure out how the thing worked the entire ride haha. They are so similar and so opposite sometimes. Ice cream on the way home! This was one of my most favorite weekends - we had loads of family time, a date night, and the best weather ever. So thankful!